This month’s response to the Petraeus-Broadwell scandal reminds me yet again of our human fascination with narrative hindsight, and of our human incapacity to capture anything real about a life. By the time you’re reading this article, the scandal will have retired from the spotlight – in a matter of weeks, going from top of the charts to bottom of the barrel. Likely replaced by another explosive, riveting, cinematic controversy. Bon appétit! It happens all the time. A gunman takes down a theater, a school. Why? The answer must be in his viewable past, maybe even captured on video or in an admissions essay. A Fortune 500 CFO embezzles. Why? The reason must be his gambling addiction. The head of the CIA compromises himself with a journalist/military officer. “Why do men cheat?” asks USA Today. The Washington Post muses: “How much [in hindsight] does Broadwell look like the cat who ate the canary?” Oh but, Paula Broadwell is “not the type” to have an affair, asserts ABC News. Nah, she was always “ambitious and inappropriate,” says New York Magazine. Boy. It’s like we’re sitting in therapy with them. Get the popcorn. Fact is, I don’t know how much we can understand about any one life, our own included. Truths emerge in moments, and if we’re lucky, someone will pay attention and remember. Assuming that’s desired. The things I’ve said that get quoted back to me are rarely the ones I myself would’ve pegged as memorable. Yet they stayed with someone. These people captured a moment of my life that escaped even my own attention. And here I was under the impression that no one knew Me more than me. But if strangers may glimpse a side of me that I’m oblivious to, we might just be quantifying the wrong thing. Or rather, we shouldn’t quantify at all. It’s not about how well or little we know someone. A life can’t be captured in a moment. An answer can’t be found in a diary entry. Still, that moment and that entry means something. Each piece of us won’t make up a whole, and what we believe to be our whole is always missing several pieces. Consider how we construct a jigsaw puzzle. (I Love the 90s.) We constantly refer to the picture on the box, the Whole we intend to recreate. Lives, of course, don’t come with a picture on the box. All relationships start with moments and anecdotes. Pieces. The more ambitious of us start clumping these right away, closing the gap between one story and another, forcing assumptions about this other person as we do. Eventually, we claim to wholly know them. Except when change strikes. Damn change. “It’s like I don’t even know who you are anymore!” we cry. But is change the only culprit? Is it true to say we don’t know them ‘anymore’? After all, did we ever? How much can we understand about any person, given that there was never a picture on the box? Heck, how much can I understand about me? So, ‘wholly knowing someone’ can’t be the point. And if it is the point, we’ll never reach it. I believe we tell on ourselves all the time – we reveal secrets behind our eyes, in between our words. Secrets we don’t want others to know, secrets we don’t even know about ourselves. But secrets don’t fascinate me as much as the way a life hides in plain sight. Because everyone is looking for a secret and no one is looking at the truth. And what is the truth? I don’t think the truth is a life pried open. I think the truth is that no life, pried open, will resemble its whole. The truth is that all lives elude discovery. We mustn’t overstretch their parts. The most we can do is stay awake for their occurrence. One of my favorite films is Chris Nolan’s The Prestige (2006). Having read the book, I can safely say that the film ponders with greater depth. In the end, it turns out not to be about magic or even about interesting secrets. Rather, it’s about our fixation on secrets, our fixation on finding pieces that represent a whole. “Now you’re looking for the secret,” the film tells us, “but you won’t find it. Because you want to be fooled.” A magician may trade his secrets, but his trade lies not in secrets. His trade lies in the man who holds them. I think we want to be fooled because humans (generally) desire ownership of each other, as if that ownership signifies a security, a certainty. An absolution. The illusion of wholly knowing someone feeds into our ownership of them. “Oh, I know you too well,” we say, asserting both genuine affection and our belief that they belong to us in some way. We want to believe we can know – and even own – the entirety of who they are just by piecing together little vignettes, little moments of their lives. We want to be fooled into believing that these pieces of a person represent their whole. They don’t, of course. And so we’re looking for the secret, but we won’t find the answer. People are not meant to be owned, and whether we like it or not, their mysteries elude our grasp. We assume a similar relationship with public figures. Last month, Petraeus and Broadwell’s faces sprawled across my laptop screen in greater close-up, in higher definition than I have ever even seen my own face. And I spend a lot of time in front of the mirror, so this is not from lack of trying. Our voyeuristic access creates the illusion of familiarity. When I was little – before my excellent public education set in – I thought people on television were really in my living room. And let’s face it: Somewhere instinctively within, we still believe that’s true. It isn’t. We don’t own public figures any more than we own our loved ones. And even if I can count their pores on my retina display, I still wouldn’t know the first thing about their person. When we mistake those pieces for a whole, we misunderstand both piece and whole. We’re not looking to know a life. We’re looking to know a life through a keyhole. And because we’re looking for a secret, we’ll never see the answer. 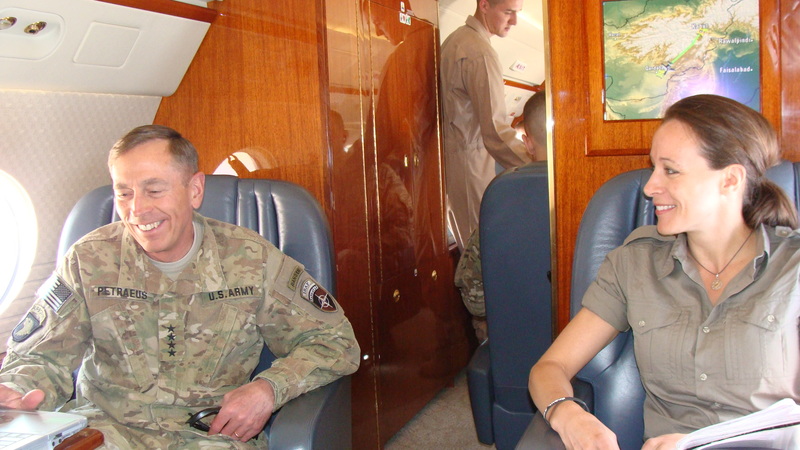 This sideshow coverage on Petraeus and Broadwell says far more about us than it does about them.